Prunes or Just Plum Crazy? As Portland's farmers' market scene matures, the infrastructure that supports it does, too. 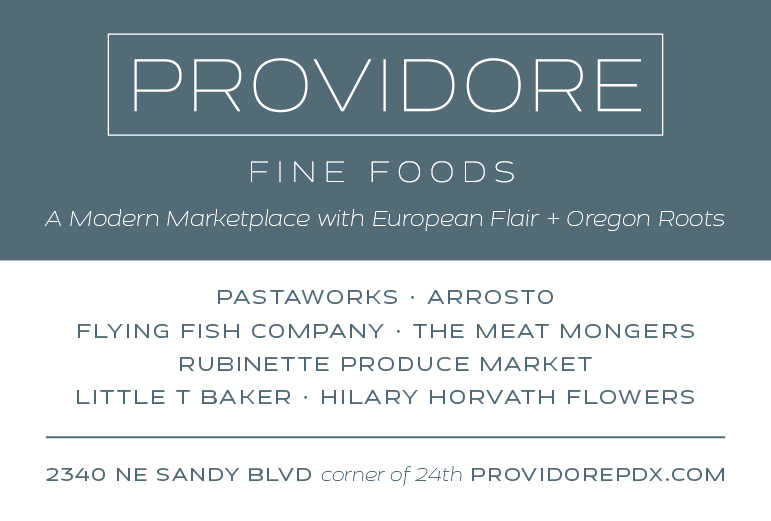 One, the Montavilla Farmers' Market, has added the position of Resident Chef to its roster. The person who fills that position is contributor Kathryn LaSusa Yeomans, who recently wrote a post on making fig jam for GSNW. The wind and rain welcomed me to the market on my first day as Resident Chef. Thankfully, so did all of the wonderful, brave vendors, holding tight to tents and umbrellas as they protected their bundles of homegrown sunshine from the gusts and gales. After tooling about the market and visiting with the producers of some of the most spectacular produce, meats and fish that the city has to offer, my thoughts turned to dinner. After all, the Resident Chef has to eat. "And eat well," I thought to myself as I perused the catch of the day at the Wild Oregon booth. Chinook and silver salmon gleamed deep orange from within tidy sealed packages. The market works in mysterious ways at times—or maybe it's obvious ways. I was thinking of my salmon dinner, and what to pair with this protein, when I glanced up and saw the most beautifully round, pinkish-red radishes nestled together in a bed of vibrant radish greens. Xnipec! In the Yucatan there is a salsa made with radishes, cilantro, chiles, tomato and bitter orange juice. The Mayan word is xnipec (pronounced shin-ih-pek), which means "hotter than a dog's nose," and describes a salsa that is so picante that it is likely to make a dog's wet nose hot. It pairs beautifully with rich seafood; salmon, scallops and the like. Perfect for a "Hey, it's still summer, what's the deal with all this weather?" kind of day, its bright, crisp, fresh flavor would be ideal over warm seared salmon. I was sold. I practically skipped away with my Wild Oregon salmon and Simplicity Gardens radishes (Vyasa and Gopal grow spectacular produce that they line up like glistening jewels at their booth) as I ventured off in search of more salsa ingredients. Recalling Derek's salsa demo earlier in the day, I headed for Hassing Farms to seek out some hot chiles. They have a wide variety from sweet roasting peppers to blow-your-brains-out spicy chiles. I snatched a few serranos; spicy, grassy, skinny little pointed peppers. Directly across the row I gathered fresh, fragrant cilantro and sleek scallions (green onions) from Maryhill Orchards. 19th Street Farms had nice ripe tomatoes, rounding out my shopping list. Mid-afternoon, the sun peeked out, welcomed by shoppers who streamed into the marketplace. At home, I assembled the salsa, substituting the bitter orange juice (from Seville oranges, available in the winter, but difficult if not impossible to find this time of year) with fresh squeezed orange juice and a little lime zest and juice. I sautéed the salmon, crisping the skin and searing the flesh golden brown. At the last minute, the salsa was added to the pan, sizzling and bubbling bright and vibrant. 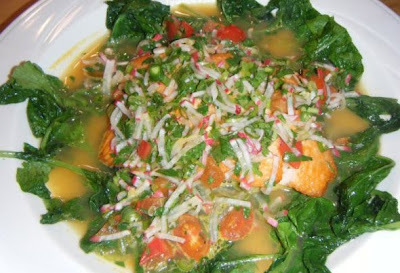 I paired the Salmon in Salsa Xnipec with the deep green radish tops that I sautéed separately with a little olive oil, salt and pepper. Deeply satisfying, I felt summer linger longer that evening, sun-filled goodness flourishing on my plate. 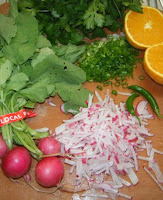 Combine the citrus juice and zest, serranos, radishes, green onion, cilantro and tomato. Stir in 1 Tbsp. olive oil. Season with salt and set aside to allow flavors to meld, about a half an hour, and up to 3 hours. Season the salmon on both sides with salt. Over a medium flame, heat the skillet with enough oil to form a generous film on the bottom of the pan. Once the oil is hot enough to sizzle when the fish is added (the oil should be shimmering but not smoking), slip the filets into the pan and sear on each side, cooking to desired doneness. When the fish are sautéed to your liking, drain off any excess oil that remains in the pan and all at once, add the salsa to the pan. It should immediately bubble up and boil. Turn the pan off and remove the fish to a serving dish, pouring the salsa over the top. Eat at once, served with sautéed radish greens. Heat the oil in a skillet. When the oil is hot, shimmering but not smoking, add the radish greens, tossing and cooking for a minute at most, until they wilt and are tender. Season with salt and pepper. i grow serranos at home - they have by far been the most successful in this strange oregon summer! thanks for the recipe idea!!! My peppers have been going gangbusters, too…what great weather we've had! Very Xciting this Xnipec recipe is! It took me back to my trips to the Yucatan, where everything has those X-y Mayan names (places and food). It has inspired me to make my favorite Yucatecan dish called Tik-n-Xic, fillet of white fish smothered in an achiote-chili-lime paste and steamed in a banana leaf. It is most Xcellent. Perhaps GSNW's most xquisite comment yet! I envy your travels…we've been to the left coast of Mexico, but not yet the right. Sounds lovely!